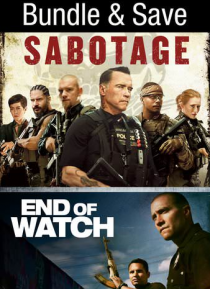 This bundle includes the films Sabotage and End of Watch. Sabotage: Arnold Schwarzenegger stars in the pulse-pounding action film Sabotage, from the director of End of Watch and the writer of Training Day. When DEA task force leader Breacher Wharton (Arnold Schwarzenegger) storms a heavily armed cartel safe house, rogue members of his team use it as a cover to steal $10 million in cash. But just w… hen they think their secret is safe, agents are killed off one-by-one, and everyone is a suspect, including the squad itself. End of Watch: From the writer of Training Day comes a gripping, action-packed cop drama starring Jake Gyllenhaal and Michael Peña. In their mission to abide by their oath to serve and protect, Officers Brian Taylor and Mike Zavala have formed a powerful brotherhood to ensure they both go home at the end of watch. But nothing can prepare them for the violent backlash that happens after they pull over the members of a notorious drug cartel for a routine traffic stop.